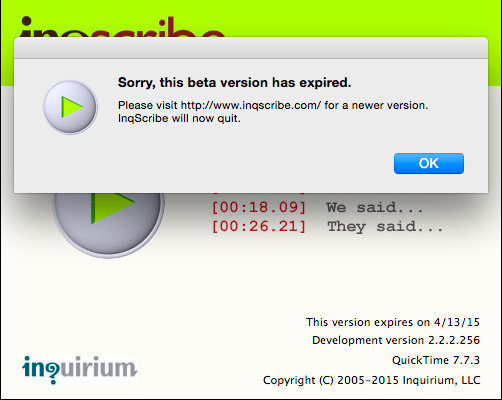 InqScribe version 2.2.2 was accidentally released as a “development build”, which behaves exactly the same as a production build except that it has a built-in expiration date of April 13, 2015. This means that if you were running 2.2.2, InqScribe won't be able to open from here on out. InqScribe version 2.2.3 fixes this problem. It's a free update, and your existing license will work with it. All you need to do is download and install InqScribe 2.2.3 and you’ll be up and running again. For more detailed instructions, head over to this installation guide. We are acutely embarrassed by this error and apologize profusely. In addition to removing the expiration date, version 2.2.3 fixes a few bugs and adds support for exporting to WebVTT, which is becoming a common means to add subtitles to streaming video. Both YouTube and Vimeo, for example, allow you to upload WebVTT files to caption your videos. You can read more about InqScribe’s new WebVTT support here.